Every year when the Census Bureau releases its annual updates on the economic well-being of the nation and our state, we turn to a measure that has largely been rejected by most people as reflective of what it takes to get by today. 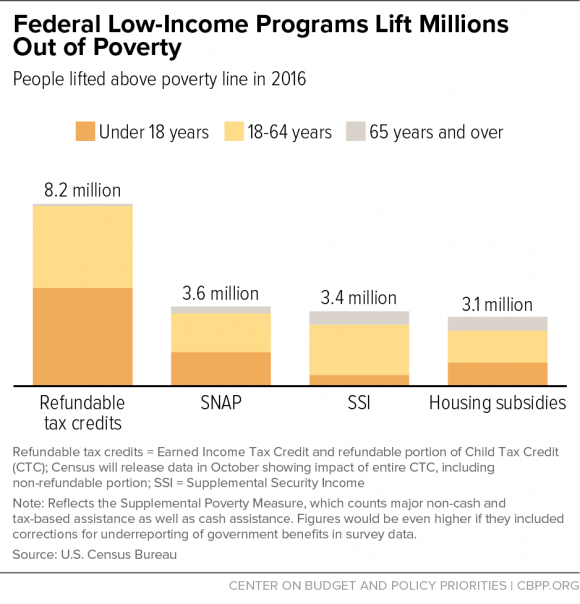 The poverty measure, as typically lifted up in media reports, is calculated based on the food choices of families living in the 1950s. There are various efforts to get a more accurate sense of what it actually takes to makes end meet and avoid hardship—doubling the figure is one way that gets you to the definition of low-income in most circles, and another is developing market-based measures on the costs of the full range of goods a household needs, like the Living Income Standard. This is the fifth installment of a Back to School blog series (see Part 1, Part 2, Part 3, and Part 4) that highlight various issues to be aware of as the 2016-17 school year kicks off. As North Carolina’s school children and their families settle back into the rhythms of the school year, thousands of these students will attend schools that have been labeled by the state as low performing. These are schools that received a school performance grade of D or F and failed to exceed expected growth based solely on test scores. The controversial school grading system, which began during the 2013-14 school year, has been rightfully criticized as unnecessarily labeling schools as failures by using a ham-fisted measure that correlates with poverty rather than the educational quality of a given school. But the grading system has had the unexpected benefit of identifying high poverty schools that require additional interventions to help low-income students overcome the educational obstacles commonly found in impoverished communities. Unfortunately, the vast majority of North Carolina’s low-performing schools do not receive meaningful additional support from the state. The existing program that aims to improve low-performing schools is known as Turning Around North Carolina’s Lowest-Achieving Schools (TALAS). TALAS, enabled initially by federal Race-to-the-Top funding, invests in professional development, school improvement planning, and instructional coaching and mentoring for school leaders. While these services are important, this limited intervention focuses primarily on training school leaders and fails to boost additional support services for students. Studies on the program have been mixed thus far, and the gains that have been realized are jeopardized by the high level of turnover among the teachers and administrators who have benefited from the enhanced professional development and leadership coaching. Even this modest intervention is only provided in 79 of the 581 schools that were labeled low-performing during the 2015-16 school year. No major legislation has been discussed in recent years to help these schools other than the recent creation of a controversial “Achievement School District” (ASD) that will serve just five schools with a charter school takeover model that has not shown promising results in other states. The ASD debate demonstrated a belief held by many lawmakers that we simply do not know what educational interventions will help children so we have to try something new even if it is unproven or shows poor initial results. Thankfully that is not the case. There is a growing body of educational research based on an improved understanding of the way children’s brains develop and a vast body of empirical research on educational programs from across the entire country that point to specific educational interventions that can help make a real difference in a child’s educational development. At some point, policymakers must recommit to improving the public school system that educates the overwhelming majority of North Carolina’s children through additional state funding and support services. In North Carolina, possible research-based interventions that would immediately help students in low performing schools include 1) increasing access to North Carolina Pre-Kindergarten and other early childhood services, 2) recruiting and retaining high quality teachers, and 3) investing in up-to-date textbooks, instructional materials, school technology, and broadband access. This is the fourth of a Back to School blog series (see Part 1, Part 2, Part 3 and Part 5) that highlight various issues to be aware of as the 2016-17 school year kicks off. Ensuring that students arrive to class with enough food in their stomach is an important ingredient for student success. Adequate nutrition reduces the negative effects of hunger on a student’s academic performance and behavior in school and promotes other positive outcomes. Access to adequate nutrition is a vital support service that contributes to a high quality education. This is accomplished largely through school meal programs – breakfast and lunch meals – which are available to students during the school day. The state’s uneven economic recovery has left many North Carolina’s workers and their families more vulnerable, and food insecurity is a reality for many students and families across the state. Half of North Carolina’s public school students qualify for free or reduced school meals, which highlights that a significant number of students reside in low- and moderate-income households that face persistent economic challenges. Moreover, one out of every five children in North Carolina attends a high-poverty school – defined as a school in which 75 percent or more of students are eligible for the federal subsidized school lunch program. Among students of color, that number is one in three. With more than 1.5 million students in public schools, that means that many of our schools serve a large number of economically disadvantaged students. Recognizing the connection between adequate nutrition and student success, many North Carolina schools have taken steps to boost access to school meals. Last school year, more than 750 schools across the state participated in a nation-wide Community Eligibility initiative, which provides school meals to all students free of charge. With nearly 60 percent of eligible schools participating in this initiative, this is promising progress to build upon and expand access to nutrition to more students. Other opportunities exists that would help ensure that students arrive to class fed and ready to learn. State lawmakers can boost state funding for child nutrition programs, which would allow for more federal dollars to flow to the state for child nutrition. As are result, these additional state and federal dollars would free up local funds that are now used to cover costs related to school meal programs – these dollars could now be directed to the classroom. Furthermore, increasing participation in school breakfast programs offers a promising return on investment. Research shows that children who eat breakfast – closer to class and test-taking time – perform better on standardized tests than those who skip breakfast or eat breakfast at home. As we embark upon a new school year, we should consider access to adequate nutrition a core component of a quality education. Greater support at the state level can help make sure that schools have the resources needed to provide a quality education for all students, which includes access to adequate nutrition. This is the first of a Back to School blog series (see Part 2, Part 3, Part 4 and Part 5) that highlight various issues to be aware of as the 2016-17 school year kicks off. It’s back to school time, and more than 1.5 million students are preparing to embark upon a new school year. Currently the 10th largest public school system in the nation, North Carolina has experienced steady growth in the number of students entering school doors in local communities across the state – enrolling more than 100,000 additional students over the past decade. 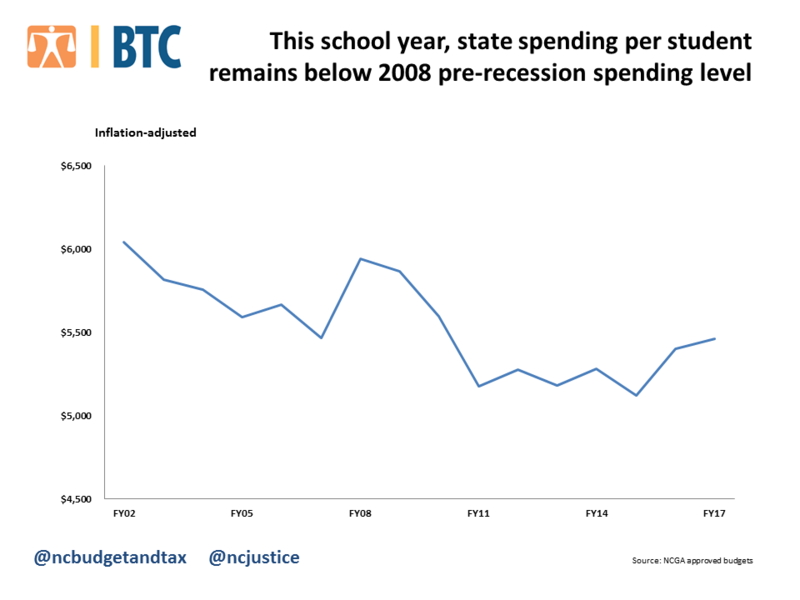 This makes it more important than ever to increase investment in schools to ensure the growing number of students in North Carolina receive a high quality education. The makeup of students in public schools has changed over time. Last school year, no single race or ethnic group represented a majority of North Carolina’s student enrollment—a reflection of the changing demographic trend in the state’s broader population. Furthermore, one of every two students in public schools qualified for free or reduced school meals, which indicates that a significant number of students reside in low- and moderate-income households and face persistent economic challenges. One way to ensure that our schools have the resources to provide a quality education to all students, regardless of their socio-economic background, is through the state budget, which serves as an important source of education funding for our schools. For the upcoming school year, the state budget under which schools will operate is a mixed bag of incremental progress in some areas and persistent lagging support in other areas. For the 2016-17 school year, state funding per student remains 8.1 percent below 2008 pre-recession level, with more than 81,000 additional students enrolling in public schools during this time. Consequently, our schools are challenged with educating more and more students with fewer resources. Our Back to School series ends today just like the first or second week of school will for millions of North Carolina public school students. If there is anything that should be taken from this series it is that in the light of what seem to be tremendous problems, we still see success. It would be foolish to say that we see the success that we all want to see. We still have problems with a school-to-prison pipeline that takes too many students out of an educational environment and, worse, puts mostly minority students in contact with the criminal justice system. Too many immigrant students are not being enrolled in school based on their perceived status. As you may note from this very series, the state has not invested in the programs that help students to achieve.